How much does it cost to travel to Slovenia? How much money will you need in Slovenia? €75 ($85) is the average daily price for traveling in Slovenia. The average price of food for one day is €19 ($21). The average price of a hotel for a couple is €83 ($94). Additional pricing is in the table below. These average travel prices have been collected from other travelers to help you plan your own travel budget. How much money do I need for Slovenia? Slovenia is in Eastern Europe and is also in the eastern portion of the Alps. The landscape is beautiful and varied. Within this small country you can visit gorgeous Mediterranean coasts that run along the Adriatic Sea, wonderful peaks in the Julian Alps, and rolling hills in the middle of the country. Slovenia clings tightly to its culture, making it a wonderful place to visit where you can experience a different and unique part of Europe. Parts of the countryside actually appear quite similar to the neighboring Austria, but the culture and the people are strikingly different. As you drive down the street you'll pass by beautiful shrines and striking baroque steeples. The cities offer much to do in the way of sights. The capital, Ljubljana, has been likened to Prague, but to truly experience the country head into its untouched wilderness. The dramatic mountains offer activities for wildlife lovers, hikers, and adventure sport enthusiasts. To truly experience Slovenia, you must step outside the cities into the unparalleled nature it offers. This is really a country for outdoor enthusiasts. Whether you're interested in rock climbing or trekking, there are plenty of places for you to explore. Because Slovenia is so small in size, it is relatively easy to travel around. Trips are generally short and fast, but in recent years there has been a decline in public transportation. Car ownership has been on the rise in the country and as result many bus schedules have be greatly reduced. It's best to look at a schedule ahead of time in order to plan your trip, particularly if you're traveling on the weekend. Slovenia is quite cheap compared to the nearby Switzerland, Austria, and Italy, but it's more expensive than most countries in Eastern Europe. In particular, the capital city of Ljubljana can cost dramatically more than the surrounding countryside and small towns. One option to save money is to stock up on supplies and foods in a large, major supermarkets. These prices are often less than the smaller markets you'll find around town. Slovenia is well connected to Italy and there are frequent buses that travel between various cities in the two countries. Depending on which city is serving as your departure point, and where you hope to arrive, you should find plenty of connections. It is more convenient to make the trip on a weekday when buses are generally more frequent and the ride is more efficient. If you are driving a personal car or rental vehicle you will be required to pay a road tax. Any vehicles that are caught on the roadways without having paid the tax will be fined heavily. You can pay the tax at the border when you arrive. The border guards are suppose to provide you with the necessary information so that you understand the fee you are required to pay. They do not always do this, so make a point of asking if things are unclear to you. Because more residents now own their own vehicles, public transportation in this small country is slipping. You should find rides on weekdays between most towns, but on weekends it can be more challenging. Sundays are particularly slow for public transportation. Try to plan your travel days around the weekends and you should have a much smoother trip. Vegetarian food is limited in the country, but you can find salads on most restaurant menus. In larger cities a good vegetarian option is Mediterranean falafel. Outside of the cities your best option might be to go to a mini mart or supermarket where you can find some good meatless food options. A fun way to experience the Slovenian countryside is to stay at a tourist farm. You'll have the opportunity to experience all kinds of traditional activities and dine on some delicious food. 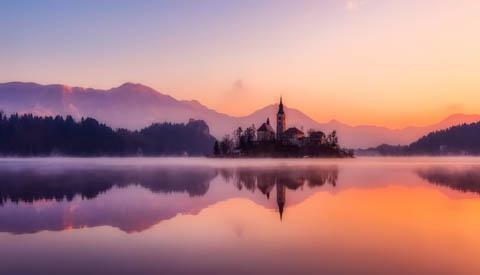 Lake Bled: Located in the Julian Alps in the northwest part of the country, Lake Bled is a beautiful glacial lake. You can enjoy a nice walk around this small, but pristine lake. Visit the Osojnica lookout point for a great view. You can do the hike in just a few hours. Celje Old Castle: This is the largest fortress in Slovenia and sits on a cliff that is over 400 meters high. It's just outside of the old town in Celje and can be visited in a few hours. It overlooks the river Savinja which wanders through the Lasko Valley. The castle is currently under restoration but it is still a nice place to visit. Postojna Cave: Located near Postojna, Slovenia, these caves are fun to explore. You can take a tour that covers about five kilometers of the area. There is an electric train that covers some of the area. Within the caves you'll see stalactites and stalagmites that create an almost fantasy like world. Food in Slovenia is hearty and filling. It makes use of meat and potatoes, but it's also heavily influenced by it's nearby neighbors. You can find some excellent pizza throughout the country, but you can also find dishes that are similar to those found in Hungary or the Balkans. Main course dishes are often cutlets that are served with a variety of side dishes. The food is quite good, unless you're a vegetarian. Finding dishes that don't use meat can be challenging. Kraski prsut: This is a dried ham product that can be compared to Italian prosciutto. It is generally less salty and dry than most cured ham products and therefore has a more mild and gentle flavor. Struklji: Struklji is a traditional dumpling dish that is stuffed with any number of things, ranging from meats to sweet fillings. Before the 1930's they were prepared almost exclusively for special occasions, but now they are more common and found everywhere in Slovenia. Today, those prepared for festivities are often made with a tarragon filling. Jota: Jota is a soup dish that is created with beans, sauerkraut, potatoes, meat and seasoning. It's most commonly served in the winter months when it's made with pork and offers a hearty meal option. In Ljubljana you can visit the national museum of Slovenia. It is Slovenia's oldest and biggest museum and is actually quite impressive. It was created in 1821 and houses a variety of interesting and informative artifacts, some of which date back to the Stone Age. There are a variety of permanent exhibits at the museum as well as the occasional rotational exhibit. It's worth a visit while you're in Ljubljana if you want to learn a little about Slovenian history and culture.